You only need to look at the comments under any music video on YouTube to witness people’s desperation to lump bands into a single genre. 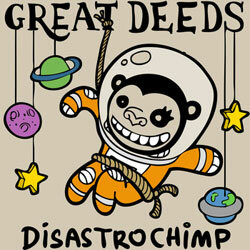 One band that refuses to be pigeon holed into one mere genre is Sheffield’s Great Deeds, who seem to revel in the fact that their punk/math-rock hybrid would give the pillocks on YouTube an aneurysm should they dare try to pin one genre to it. The first 90 seconds of opener ‘Bulb’ delivers a concise slice of the conflicting styles that are on display throughout this five-song EP. After a gentle interlude, it bursts out of the traps like Usain Bolt on speed with a ferocious blast of punk before the first of many ‘noodly’ guitar sections unceremoniously announces itself on the scene. This isn’t so much a hint that Great Deeds don’t deal in standard song structures, but more of a thump around the head with an industrial sized mallet. The EP’s standout moment comes on ‘Brick’, which brings back fuzzy memories of mid-00s math-rock upstarts Yourcodenameis:milo, with its melodic and driving choruses perfectly balanced against fractured verses. The pulsating ‘Leger’ sounds like it’s better suited to a live setting, while closer ‘Blueprint’ brings the frenetic pace down a little to conjure up a sound that falls somewhere between Minus the Bear and Foals. Perhaps the best description of the EP comes from the band themselves on ‘Tongue’, where they croon: “it’s the message to be delivered with all the subtlety of a boot in the teeth.” This EP certainly isn’t subtle, but it’s a hell of a lot more fun than a booth in the teeth.